Editor’s Note: There will be a series on the Lord’s Prayer in 2019. This follows the Apostles’ Creed (2016), the Protestant (Radical) Reformation (2017), and the Mental Health Initiative (2018), whose articles are, or soon will be, available online in booklet form. I once made a bad mistake. I had concluded a committal service at the cemetery by inviting the group to say the Lord’s Prayer with me. Later, at the church reception a total stranger approached me in anger. “You treated my God with contempt,” he shouted. 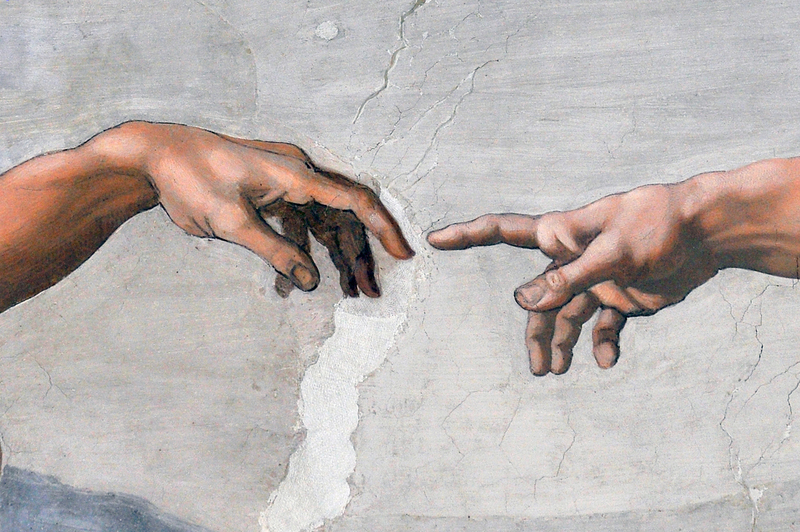 “You said, ‘Our Father which art in heaven.’ ‘Which’ implies God is a thing. That’s terrible; you insulted God.” He was furious. I was so taken aback that I could not even explain why I had done it. I just apologized for my bad language. After he turned away I realized what had happened. I had recited the King James version as I had once memorized it and as I had used it for decades. I still use the Prayer when I lead committal services. But I’ve left the language of 1611. We speak about reciting the Lord’s Prayer. Or about saying it. Such expressions have a liturgical feel about them. Let’s just pray the prayer from the heart. It should seem like a conversation. However, prayer seems like a mystery; the longer I toil at it the more mysterious it seems. Maybe that should not surprise us. Even the Apostle Paul, who understood many things far better than I do, says simply, “We don’t know how to pray as we ought” (Rom. 8:26). So, while I may not understand it either, I will try to say a few sensible things about it. I am puzzled. The first line of Jesus’ prayer sounds as if the prayer is intended to be used in the assembly of believers. “Our” implies the prayer will spoken by a group. However, the context shows that Jesus was not thinking of group prayer here (He did that in Matt. 18). Here he says if someone wants to pray they are to go to their room, shut the door, and then pray (Matt. 6:6). This sounds like personal, private prayer. I have thought that Jesus meant that he and we have the same Father. Like, “When you speak to the Father you are also speaking to my Father.” Helmut Thielicke has a significant addition to that. He suggests Jesus taught us to pray “Our Father” because we are to remind ourselves that Jesus is with us when we pray. “Our” refers to Jesus and me. In prayer we stand beside Jesus and tell the Father what we need; in other words, Jesus and I are together on this. This is another way of reminding ourselves of the same truth that we verbalize when we conclude our prayers with “In Jesus’ name” (Matt. 18:19, 20; John 15:16). By reminding ourselves that we are onside with Jesus, that we are praying with him, that we are praying for that which we can request in Jesus’ name, we are reminding ourselves that it is important that we pray for that which agrees with Jesus’ will. Jesus was the messenger of the Holy Trinity who came to us in the far country of earth to seek us and reconnect us to the Triune God in heaven. Among other things he wants to be with us in our praying. If we could remember this, our prayers would likely seem more valid and more essential in heaven. It might also destroy our self-centred, narcissistic focus on ourselves. That would likely be seen in heaven as a healthy and wholesome change. And maybe we could even learn to enjoy the liberty of being more interested in Jesus’ concerns than in ours. I’ve heard it said that Jesus introduced a new God concept when he spoke of “Father.” That hardly agrees with the evidence. First of all, God himself assumed the role of father when he declared, “Israel is my firstborn son” (Ex. 4:22, 23). The Lord assured King David about the son who would succeed him, “I will be a father to him and he shall be a son to me” (2 Sam. 7:14). The Lord in his compassion is compared to a kind father (Psalm 103:13). Isaiah uses the “Father” term three times (Isa. 63:16; 64:8). What Jesus does is that he takes a concept that had been only sparingly used in the Old Testament and makes it central for the lives of his people. Jesus is not only teaching his disciples how to pray, he is showing them how to think of God. In Israel’s history it was a momentous day when Moses heard that the God with the generic Semitic title of Elohim was for them the God with the personal name Yahweh. Now Jesus takes the revelation of who God is one step further. Not only is God personal, he is like a father. Like a good father, God is there for us before we pray. He has far deeper and more informed interests in our lives than we ourselves have. It may seem as if God is not hearing our prayers; but like a good father he may be waiting to give us what we need instead of what we desire. Like a good father he knows our needs before we report them to him (Matt. 6:8). Why then pray if God already knows more than we ourselves know? Because God wants us to grow into a relationship with him. Good relationships require intelligent verbal interaction. That is true of the spousal relationship, of the parent-child relationship, of the members on a hockey team, and of the corporate board. It is especially true of our relationship with God. It starts by turning to him and speaking out, “Our Father.” With that we treat him as a personal God. And the greatest blessing of the prayer life is not that we get a few things for free, without our toil, but that we sense we’ve been in fellowship, we’ve been in the presence of our Father. When people stop talking with God they may still do some theologizing, but they are then only talking about God. I understand Roman people would pray to “Father Jupiter,” and Greeks would turn to “Father Zeus” in prayer. Jesus’ followers are to pray to the Father who is in heaven. This is where the mystery of which I spoke above reaches its depth. How is it possible that we people of earth can with our words, even just with our thoughts, connect with God in his eternal, spiritual dimension? The mysteries of heaven continue to confound me. Where is it? What is it? How can the God of heaven, who is Spirit, influence affairs in our kingdom of sticks and stones and flesh and bones? I wonder, and I keep on praying. And now a concluding thought for your reflection. I suggest that if every one of the seven billion people on earth would pray to God simultaneously, God would pay fatherly attention to each one of them. That’s how it works in heaven! Arden Thiessen, DMin, has long served our conference as a pastor, Bible college professor, EMC moderator, and author. He and his wife Helen live in Steinbach, Man., and are part of Steinbach EMC.